Summer Learning Loss: Stop the Leak! Boys will be boys, but they can learn map-making when getting ready to explore the neighborhood! Summer learning loss, also called summer slide or summer learning leak is what happens over summer vacation when kids stop going to school. During the summer, kids forget what they learned during the school year. Avoiding summer learning loss should be every parent’s goal going into the long summer vacation. When children are in school, they learn and make steady learning progress. This is true of all children, no matter whether their parents are rich or poor, or where they live. When summer hits, however, learning stops cold for most children. Summer learning loss is what happens when kids are out of the classroom for months at a time. 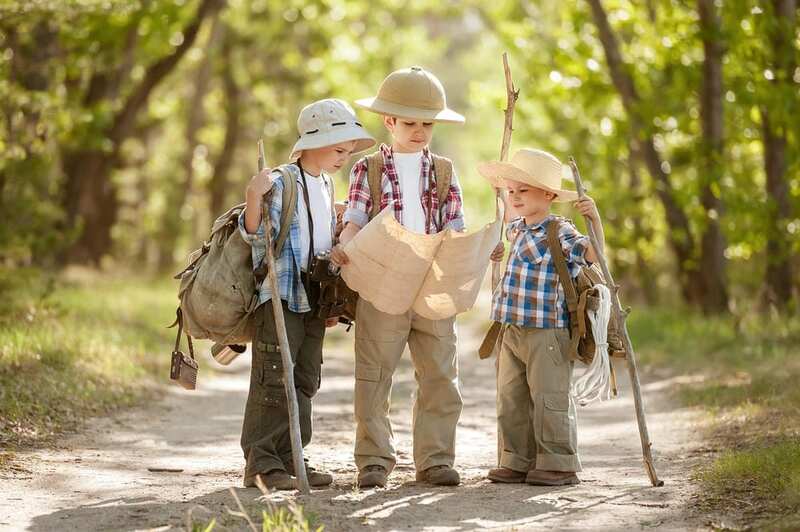 Experts have been looking at summer learning loss for 100 years now, so there’s lots of data to prove the phenomenon is real. They’ve had children take a test on general knowledge at the end of the school year, and then again, at the end of summer vacation. The first test score is always higher than the second. These children have forgotten what they knew at the start of summer. It’s good to have fun in summer, but at what cost? Summer learning loss, on the other hand, is not just about forgetting. When children learn every single day, their minds stay focused on the learning. Learning new things makes the brain grow pathways called synapses. During the school year, kids are in active learning mode and are growing their brains. Out of school for summer, however, the focus changes and math and reading slip into the background. The mind is no longer in active learning mode, and instead of growing the brain, there is a slow leak of knowledge as the summer drags on. On average children lose about two months of learning ground each year due to summer learning loss. Once school resumes, teachers must bring kids back to where they were before summer began in order to move on to new work. That means spending two months of the school year reviewing old material. Children are in school for some 180 days a year. Summer learning loss means spending some 60 days, a full one-third of the school year, just teaching children what they forgot over the summer from the year before! 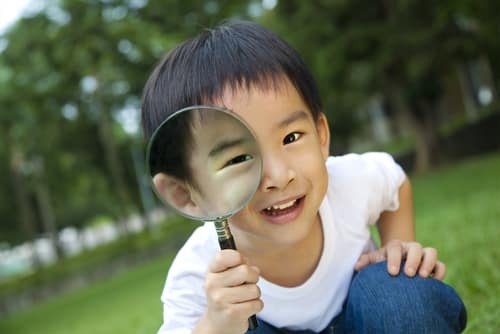 You can send your kid out to play, or you can send him out to play with a magnifying glass, which turns goofing around into a learning session! It’s not just time that’s wasted as a result of summer learning loss. It’s money, too. Experts say summer learning loss costs taxpayers $1,500 per child or more than $18,000 per child over the school years from kindergarten to 12th grade. The problem of summer learning loss is even worse for children from low income homes. These children don’t have access to books or summer learning and enrichment programs that may be available to other children. Summer learning loss for children from low income homes means they may not be reading by the end of third grade, which puts them at risk for all sorts of serious problems. Third grade is an important benchmark in education. It is said that up to the end of third grade, children are learning to read, but that after third grade, they are reading to learn. Children who cannot read well at this point, begin to fall behind in the classroom until they just don’t know what’s going on. When the struggle to understand becomes too much to handle, children may drop out of school. Dropping out of school puts kids at risk for future unemployment, drug abuse, and criminal behavior. Summer learning loss contributes hugely to the problem of academic failure, especially for kids from low-income families, who are already at risk for dropping out of school. These children don’t have books at home, so when summer kicks in, they are not getting the reading practice they need to stay in place let alone improve their reading skills. Instead , they lose their reading skills. What can be done to stem summer learning loss, or at least to lessen the loss of knowledge and skills? The most important thing you can do for your child to prevent summer learning loss is to make sure he has access to books. Can’t afford books? Get a membership in a public library. An abacus can be a fun way to explore numbers and counting. Membership in a public library can make a big difference for a child at risk for summer learning loss. Even just spending time in a library, which one can do without paying membership fees, can encourage literacy and reading skills. Find a way for your child to spend time in the library looking at picture books. 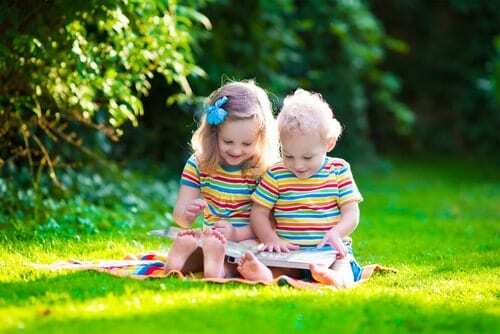 Just spending time touching books has been shown to improve literacy skills. In addition to making sure your child has access to books, you can plan fun activities with an eye to making fun activities, learning activities, as well. Every activity can be educational if you make it so. You just need to look for opportunities to create teachable moments. Let’s say you have a half an hour to spend with your child. What will you do with that time? If you cook, you could make sure your child reads the recipe and learns a bit of math while measuring the ingredients. If you take a walk, you could have your children read the street signs, and count the number of oak trees you pass. Play a word game together like Scrabble, Jotto, or Boggle. Go shopping with your child and have her find the one pound can of tomatoes in the canned goods section. Let her count out the money and pay for the groceries. In other words, every activity can be educational if you make it so! And that is the first thing parents need to know about combating summer learning loss. And having books in the house? It’s the most important thing you can do to make sure your children become great readers. No doubt, sitting in front of a computer screen also contributes to summer learning loss. That is, unless kids are surfing educational websites. Starfall is a fun site with games and quizzes to improve children’s reading skills while Cool Math offers an enjoyable way to build math skills. Is your child fascinated by science? Check out the Neuroscience for Kids website. It’s been proven: Just handling the pages of a picture book can improve a child’s literacy skills. Well, that all sounds awesome enough, but how do you get your child to use these sites? You tell your child that for every minute spent on an educational website, he can spend time doing stupid stuff. Who knows? You may just find your child getting hooked on the fun games, quizzes, and educational videos at these sites, with the result that he or she spends less time on social media and goofy stuff. Know of other great educational websites? Please do share them in the comments below, so other mothers can gain from your experience. What do you do with your child that’s educational and fun during summer? Next Next post: Immunization Debate: Do You Say Yes to Vaccines?